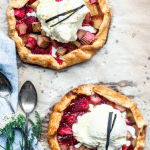 Strawberry Rhubarb Galettes with Vanilla Bean Ice Cream. Sweet and creamy Vanilla Bean Ice Cream on top. I can’t think of a better dessert! Simple. But everything is homemade, from scratch, made with care and love. Let’s break it down. And talk about the recipes involved in making these Strawberry Rhubarb Galettes with Vanilla Bean Ice Cream. Let’s start with the crust. Pie crust. Know how to make a flaky one! Practice until you master the little details. Flaky pie crust is a saga I pursued a few years ago! I set myself to bake one pie a week, until I had mastered the crust! I baked one pie a week for a while (and then many more pies after that too). And here’s what I have to say about it: cold cold cold! Cold makes a difference! Biggest tip from me. Make sure your fat is super cold before adding to the dough. Make sure you let the dough get cold enough in the refrigerator before rolling out. And make sure your pie is entering the oven, cold! The reason is very simple. 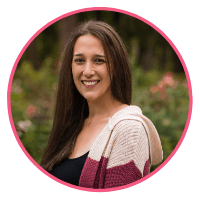 If the fat is cold, it will take longer to melt, and this way the water content in the fat won’t have enough time to react with the gluten in the flour, which would result in a less flaky crust, because it would have more gluten development! Gluten strands are proteins that develop when you add water to flour. Gluten development is what provides elasticity and structure to the dough. Two things can affect gluten development: liquid content, and mixing method. The more liquid you add, and the more, or harder you mix, the stronger the gluten formations. That’s why you tend to knead bread dough a lot more than you mix scones dough, or pie dough. For best flaky results, you want to mix minimally, and add just enough liquid. What fats to use in pie dough? I am using a combination of shortening and butter for my pie crust. Butter provides a better flavor, shortening helps with the structure of the dough. Shortening is better for the structure because it has a higher melting temperature, which means it will avoid those interactions between the gluten in the flour and the water content in the fat (which means you’ll have a flaky crust). 1-Incorporating the fat into the flour until the mixture is well incorporated will help hydrate the flour. This way, you’ll end up needing less water to bring the dough together. And as we’ve discussed, water content interferes with gluten development and affects flakiness. 2- The dough will come together easier if everything is better incorporated, so you will have to mix the water in for less time. Less mixing, less gluten development. And more flakiness! 3-The dough will stick to the counter way less when you are trying to roll it out. If you have huge chunks of fat in your dough, it will soften up and start to melt as you are rolling the dough out. 4-If you have huge chunks of fat in your dough, when you bake it, it will melt much faster than if it was incorporated with the other ingredients. So, this is what I have to say about pie dough. I could write way more. Maybe later. Tangy. Delicious. Tart. Sweet. Won-der-ful! 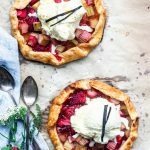 Strawberry Rhubarb is a classic combo in my house! It’s my husband’s favorite pie. 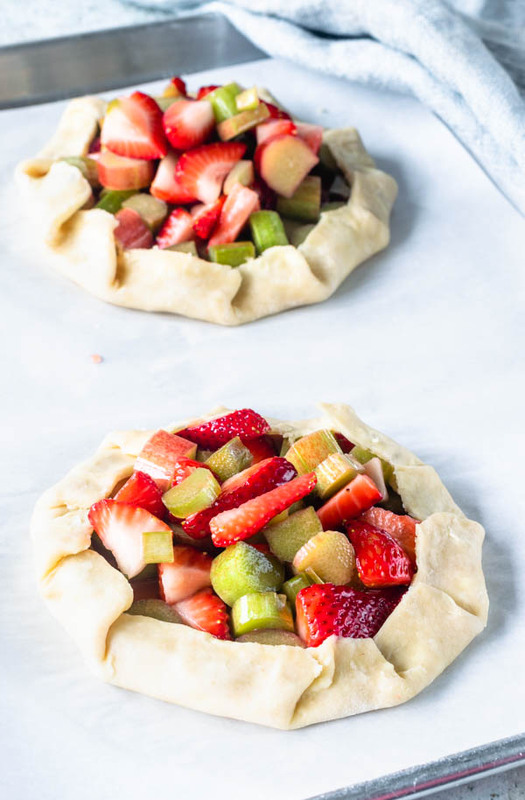 So I made these into Strawberry Rhubarb Galettes because I had the following picture in my mind. Which leads me to talk about this delicious ice cream! Homemade ice cream is the best! I love making homemade ice cream! I chose a simple Vanilla Bean Ice Cream flavor this time! Keeping it simple. Keeping it classic! Making ice cream at home is not rocket science. You just have to have an ice cream maker. This is the one I have. It’s been with me for years! It’s a good soldier! Except that mine is red. I love it. By the way, this is an affiliate link, which simply means if you buy this product by clicking through here, I receive a small percentage from Amazon, at no added cost to you. Speaking of ice cream! In this post about my Pear Crumble Pie, I have the recipe for a Maple Ice Cream! Which is to this day, my favorite ice cream! Used to be pistachio. Finally, if you want to check out more pies and tarts, here’s a couple of my favorites: this Apricot Rhubarb Almond Tart (rhubarb, yes!! again!! ), and this Cookies and Cream Pie! 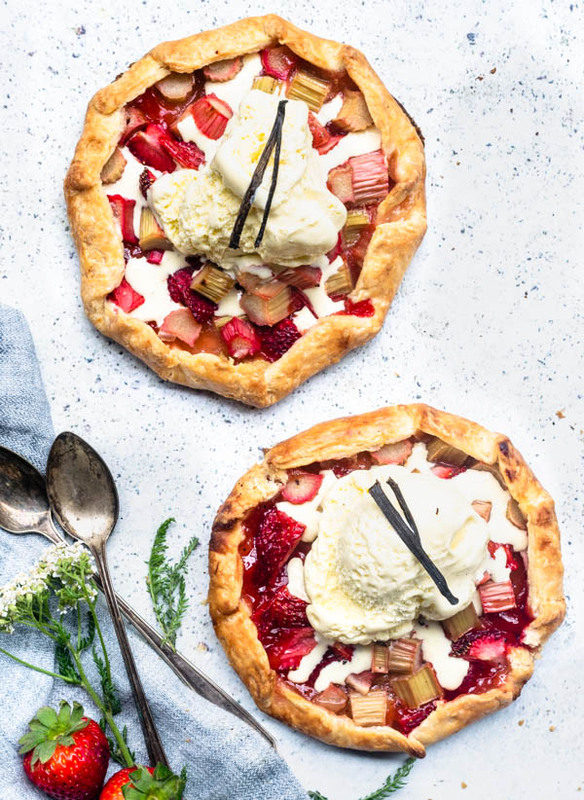 Strawberry Rhubarb Galettes with Vanilla Bean Ice Cream. The crust is very crispy, flaky, and light. The filling is tangy, sweet, and also just enough tart! Topped with the indulgent delicious Vanilla Bean homemade Ice Cream. If you make this for your guests, they might never want to leave! Start by chopping the butter into 1/2” pieces. Place butter and shortening on top of a piece of parchment or wax paper, and put it in the freezer for 15 minutes. While butter and shortening get really cold in the freezer, start to assemble the other ingredients. Place flour, sugar, and salt in the bowl of a food processor. You can also do this by hand if you don’t want to use a food processor. Mix flour, sugar, and salt to combine. If using the food processor, pulse a few times, until butter and flour mixture has the consistency of coarse meal, no big lumps of fat in your dough. If doing it by hand, you can use a pastry cutter, or a fork, or even your hands, to cut the butter into the dough. Slowly, add the 7 tablespoons of water to the dough. If using the food processor, you can add a couple of tablespoons and pulse one time. Add a couple more tablespoons and pulse again. Do this until you’ve added all the water. If doing it by hand, simply mix the dough with a spatula. Now, if the dough is clumping together, that’s a sign you don’t have to add anymore water. If the dough is too crumbly and dry, add a bit more water, one tablespoon at a time. Dough shouldn’t be too wet, but it also shouldn’t be crumbling apart. Form dough into a ball. Wrap it in plastic. Place it in the refrigerator for 2-4 hours, until completely firm. For the filling, simply mix all ingredients together. You might want to start the ice cream one or two days before you plan on serving the galettes. Place milk, heavy cream, sugar, and salt in a medium saucepan. Scrape seeds of vanilla bean, add seeds and pod to the milk/sugar mixture. Bring to nearly a boil, while stirring. Once you see all these small bubbles forming, keep your eyes open. Let the mixture lightly simmer for a minute. Don’t let it boil, keep controlling the heat in order to avoid that. Remove from heat. Set aside to infuse. I like to let my mixture infuse for about 1 hour. You could do less time if you’re in a hurry. After mixture has infused, gently re-heat it to almost a boil. Whisk yolks in a bowl until lighter in color. About 1 minute. Pour about 1/4 cup of the hot milk mixture into eggs. Whisk non-stop. That’s called tempering the eggs. You are trying to warm the eggs without cooking them. Slowly add the remaining hot milk mixture to eggs, always whisking. Through a fine mesh strainer, pour mixture back into saucepan. Cook at medium heat for a few minutes, while stirring nonstop with a wooden spoon. You are looking to thicken the mixture enough to coat the back of a spoon. Or reach a temperature of 175F-180F. If you have a thermometer, do take the temperature, to be sure. Strain mixture into a bowl. It’s very important to strain the mixture, because you want to leave out any bits of curdled eggs behind. Also, don’t forget to discard the vanilla pod. Allow mixture to cool down for about 1 hour on the counter. Stir 2 teaspoons of vanilla extract in. Place mixture in the refrigerator for 4 hours-overnight, until thoroughly chilled. Remove mixture from the fridge. Churn in your ice cream maker, according to manufacturer’s instructions. Freeze ice cream for at least 2 hours before serving. After dough has chilled thoroughly, cut it into 5 even pieces. Roll each piece out til about 1/4” thick. Cut out a 8” circle out of the rolled out dough. You’ll end up with 5 8” circles. Spread a bit of filling in the center of each circle, leaving about 1 1/2” border. Start folding the border over. Stick galettes in the freezer while you preheat the oven. If you don’t have enough room in your freezer for all galettes, leave some in the fridge while you bake the first pan. Once oven is pre-heated, brush cold galettes with a mixture of 1 yolk and 1 teaspoon of water. Bake cold galettes for about 20 minutes. Start to check at the 15 minute mark, to see if you need to rotate the pans, in order to bake evenly. To serve, spoon some ice cream on top. Galettes will keep in the fridge for up to 4 days. 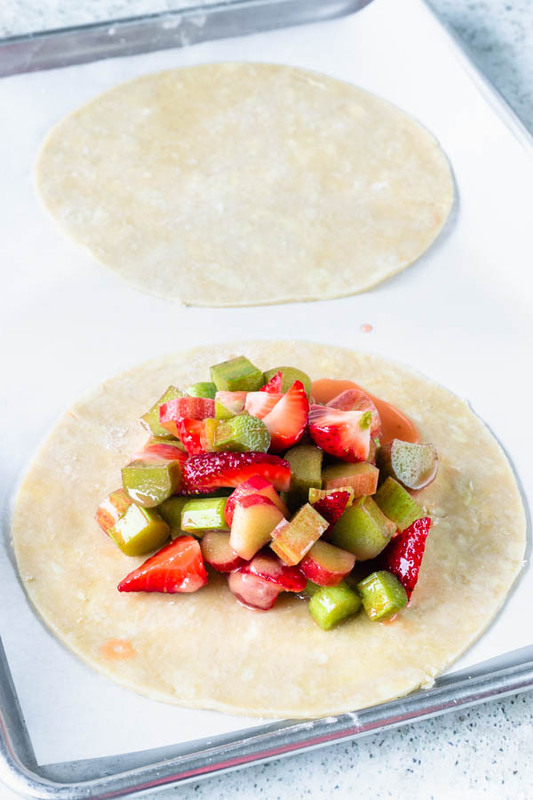 I love strawberry and rhubarb together! This would be such an incredible summer dessert to make this weekend! These are beautiful. A lovely summer dessert, and a great way to use seasonal fruit! These are so pretty! I just happen to have some rhubarb in my freezer from a friend! Ohh!! It’s perfect for this galette then!! Thank you! 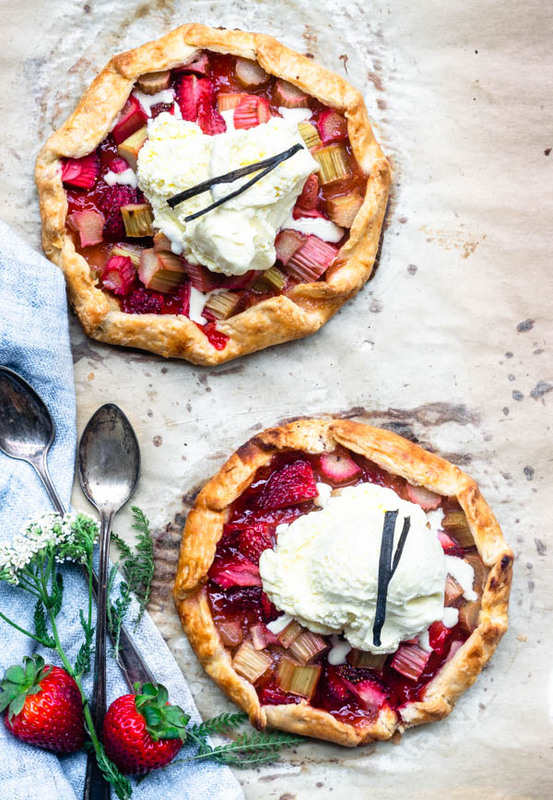 Strawberry and rhubarb is one of the best combinations ever, isn’t it? Your galettes look and sound absolutely amazing! Thank you, Leslie! I agree, one of the best combos in the world! These look perfect! Wishing I could Jeannie-blink one in front of me right now! Beautiful crust! These look lovely! Perfect for a summer party. I love how everything is from scratch..including the ice cream! It really makes all the difference! Thank you! I love ice cream from scratch! Omg 😲 I am literally drooling over the hero picture. Those galettes look so appetizing. Amazing! I often make Apple galettes. This is a must try combo too. Oh you plant rhubarb! That’s so awesome!! I have still never tried rhubarb! This recipe looks so good and your tips on perfecting pie crust are so helpful! Can’t wait to finally try this recipe! Great tips on how to make the perfect pie crust. This looks so yummy. Love the strawberry rhubarb combination. Wow to items on my baking ‘to-do list’ . I’ve been waiting to make something rhubarb flavored this season and I’ve yet to make my own ice cream! If you have an ice cream maker, homemade ice cream is easy peasy! There is just something so rustic and beautiful about a gallette. Great job with all the tips, too. Thank you. Love delicious galettes! They are rustic! Love it! Thank you! The photos are just gorgeous! This is the perfect time for both strawberry desserts and ice cream, so I’m all in! This is the perfect dessert for summer! So pretty! love love love this!!! 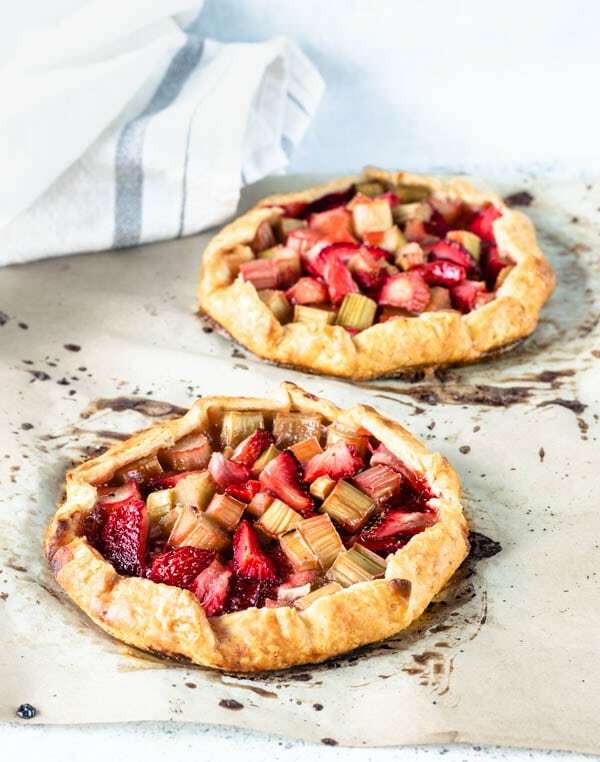 i love rhubarb, I love galette and I love that you put a vanilla bean on top too! stunning photo!